The bill to partially revise the Patent Act of Japan, etc.” decided at the Cabinet meeting held on March 11, 2011, was passed and concluded on May 31, 2011 and officially announced as Act No. 63 on June 8, 2011. This Act is scheduled to be enforced from a date to be set by the Cabinet Ordinance, within a period not exceeding one year from the officially announced date. Although the enforcement date has not been confirmed, it is expected to be April 1, 2012. As a background note, on March 11, 2011 when the Cabinet decision was made, the Ministry of Economy, Trade and Industry made the revised bill public. That day, March 11, 2011, was the day a devastating earthquake and tsunami struck Japan. It took this writer six hours to get home, on foot, from our office located in Otemachi, Tokyo. Under circumstances where the earthquake-destroyed and tsunami-leveled areas had still not recovered and reconstruction efforts had barely made any impression, and in the midst of emergency discussions on national energy policies triggered by the nuclear plant disaster, procedures for revising the Patent Act were carried out steadily. Now, we are waiting for an official announcement by the Cabinet and Ministerial Ordinances and a decision on the enforcement date. Hereinafter, an explanation will be made, with emphasis placed on revision of the Patent Act. This revision has been made in response to opinions to the effect that, for Japanese companies to remain competitive in increasingly competitive global markets, including those in developing countries, it is urgently required to promote innovation and create an improved environment in which new technologies and industries will be encouraged to invest and prosper. This revision has been made as a result of discussions held over the past three years, with an aim to reinforce the protection of license agreements and protect inventors involved in joint research, etc., to increase user convenience in view of broadening innovation possibilities, etc., and to review the trial system for quickly and efficiently settling disputes arising in connection with intellectual property issues. Hereinafter, an explanation will be made of major items covered by the present revision. This revision will introduce a so-called “automatic perfection system” under which a non-exclusive license has an effect on third parties without registration of the license. A patentee is allowed to grant a license to others. The patent right is licensed under an “exclusive license” or a “non-exclusive license.” An exclusive license will not become effective unless it is registered with the Japan Patent Office (hereinafter abbreviated as JPO) (Article 98 of the Patent Act). On the other hand, a non-exclusive license becomes effective by conclusion of a licensing agreement but shall have no effect on third parties unless registered with the JPO (Article 99(1) of the Patent Act). Therefore, holders of a non-exclusive license who are not registered may be subject to an injunction or claim for damages from a third party, such as an assignee of the patent right. This revision will introduce a system (automatic perfection system) under which a non-exclusive license has an effect on third parties without registration of the license, to properly protect the non-exclusive license and secure stable and continuous business activities. b) when registration is made on a joint application, a patentee is not obliged to cooperate in the registration, and there are cases where no cooperation is obtained from the patentee. On the other hand, in recent years, there has been a notably accelerated trend of open innovation and technology has become increasingly sophisticated and complicated. It is not realistic, therefore, to develop and produce a single product on the basis of internally developed technologies alone. As a result, in order for companies to secure stable and continuous business activities, protection of a non-exclusive license has become increasingly important. an automatic perfection system is to be introduced. A non-exclusive license will have an effect on third parties without registration, thus making it possible to protect a non-exclusive license appropriately and secure stable and uninterrupted business activities. A similar system will also be introduced for a provisional non-exclusive license, which is a license for a patent under application. On assignment of a patent right, a non-exclusive license can have an effect on a subsequent acquirer, but a problem of succession of a license agreement arises. For example, are contractual obligations passed on to the subsequent acquirer and a non-exclusive licensee? There are many unclear points in this regard, and further discussion will be needed. In addition, this revision will apply to a non-exclusive license that actually exists on enforcement. 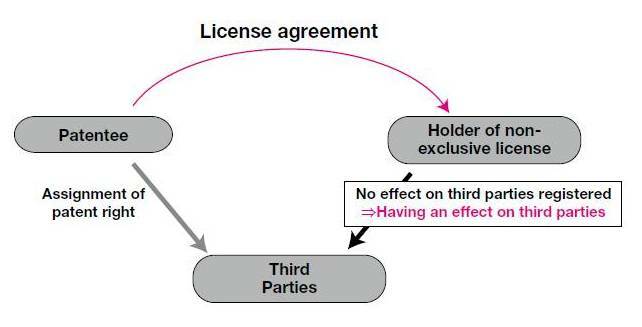 In association with abolition of the registration system of non-exclusive licenses, a licensee who obtained a non-exclusive before enforcement of the system will also be able to assert his position against a subsequent acquirer, without registration of the license after the system is implemented. Similar systems will be provided in the Utility Model Act and the Design Act (Article 4-2 and Article 19(3) of the Utility Model Act as well as Article 5-2 and Article 28(3) of the Design Act). 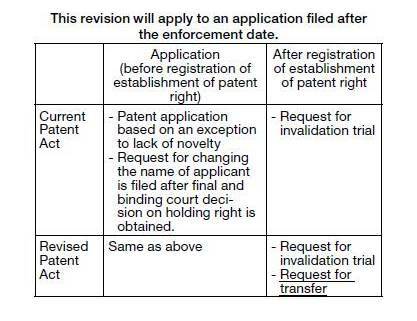 This revision will make it possible that, where a patent is granted based on a usurped application, etc., a true right holder will be able to file a request for transfer of a patent right against a person who has filed the usurped application, etc., on the ground that the true right holder has the right to obtain a patent. Under the current system, there is no provision allowing the true right holder to restore the name of an applicant and a patent right, either before or after a patent is granted. In practice, under the current system, the true right holder can obtain a patent by the procedure of the following. The true right holder files a patent application within six months after disclosure of the usurped application, etc., by which the true right holder may be able to obtain a patent right based on an exception to a lack of novelty of invention (Article 30(2) of the Patent Act). In addition, the Patent Act has been operated in such a manner that the true right holder is allowed to restore the name of the applicant before granting of the patent, if the true right holder files a request to change the name of the applicant for the usurped patent application to that of the true right holder, a written final and binding court decision being attached to the request as confirmation that the true right holder is entitled to be granted a patent. However, after granting of a patent, although the true right holder may have a patent annulled, for a reason of usurpation, etc., by an invalidation trial after the patent has been granted, there is no system for restoring a patent right. Thus, it has been pointed out that remedies given to the true right holder are not sufficient. Recently, in general, technologies and products have been developed jointly by cooperation between companies and universities, etc. Therefore, usurpation and violation of a joint application easily occur, and in reality, lawsuits are often instituted by companies and universities. Whether a true inventor is allowed to file a request for registering the transfer of a patent right when a true inventor did not file an application has been denied so far in trial cases in the lower courts. One of the reasons is due to the possibility that a patent is such that contents of a right obtained consequently may be different, depending on the person who writes the application documents, despite the fact that the patent starts from the same invention. This revision of the Patent Act is to approve a request for registering the transfer of a patent right filed after establishment and registration of the patent right, even where the true inventor did not file an application. Regarding the background of this revision, in Germany, the U.K., France, etc., a system has been introduced by which a true right holder is allowed to restore a patent right pertaining to usurpation, etc., and interested parties have found it necessary that the above system be introduced. A true right holder may have a patent annulled on the ground of usurpation, etc., on the basis of an invalidation trial, which has also been approved under the current system of the Patent Act, and can also be approved under the to-be-revised Patent Act. In other words, a true right holder is able to utilize either means, that is, to file a request for the transfer of a patent right or have a patent annulled by an invalidation trial. The Utility Model Act and the Design Act will be revised in a similar manner (Article 17-2, Article 37(1)(ii) and (v) of the Utility Model Act, Article 26-2, Article 48(1)(i) and (iii) of the Design Act, etc.). By this revision, application of the exception to a lack of novelty of invention will be expanded from a limited enumeration system to an invention made public through “actions of a person having the right to obtain a patent.” The Patent Act has a provision on the exception to a lack of novelty of invention, in Article 30, by which even an invention that has been published before application is, exceptionally, to be handled as though it has not lost novelty where the invention meets requirements such as patent application having been filed within six months after the date of publication. However, according to the current provision, application of the exception is applied only to inventions made public through conducting of a test, presentation in a printed publication, presentation by electronic communication networks, presentation in writing at a study meeting designated by the Commissioner of the JPO, and exhibition at a fair designated by the Commissioner of the JPO. Therefore, the current provision is no longer sufficient to address various presentation aspects of inventions sufficiently. Imbalances are found, for example, where the exception is applied to an invention delivered in an animated film via the Internet, while the exception is not applied to an invention presented on TV (the former is presented through electronic communication networks, while the latter will not fall under any of the designated presentation aspects of inventions). Further, such a limitation is found where, for example, an explanation is presented to investors for the purpose of acquiring research and development funds, the presentation aspect being intended in principle to be eligible as an exception under the spirit of the law by making a contribution to the development of industries, and the presentation subsequently being found to be ineligible as an exception. Therefore, in order that inventions that have been made public by a presentation aspect deemed to be in principle eligible for the exception can be included exhaustively, application of the exception to a lack of novelty of invention will be expanded from a limited enumeration system to an invention made public through “actions of a person having the right to obtain a patent.” However, inventions, etc., which are listed in Patent Gazettes or elsewhere by filing of applications with patent offices in Japan and abroad to be made public are considered not to be eligible for the exception according to the gist of the patent system, and also the system may be incorrectly operated if these inventions are made eligible. Therefore, such a provision has been provided that publications in Patent Gazettes are not eligible. A foreign applicant should consider that, under the current Patent Act and also the to-be-revised Patent Act, it is necessary to file an application in Japan within six months from the date when an action invoking a lack of novelty of invention occurs, and it is also necessary to conduct application procedures for the exception to a lack of novelty of invention. Even when a patent application is not filed in Japan, the patent application is filed on the basis of the Patent Cooperation Treaty (hereinafter, referred to as PCT), within six months from the date when an action invoking a lack of novelty of invention occurs, by which the application procedures for the exception to lack of novelty of invention can be conducted at the time of entry into the national phase. In any event, it should be kept in mind in particular that the patent application must be filed within six months from the date when an action invoking a lack of novelty of invention occurs (either an application in Japan or a PCT application). Provisions similar to the Patent Act are provided also in the Utility Model Act (Article 11(1) of the Utility Model Act). This “catch ball phenomenon” has been criticized for such reasons that court proceedings are inefficient and result in slow settlement of disputes, the court will not make any substantive determination, whereby, in particular, those who demand an invalidation trial are forced to bear unnecessary procedural and financial burdens. By this revision, a request for correction trial after a lawsuit against a trial decision has been lodged is prohibited. Thereby, the catch ball phenomenon is to be eliminated in association with the request for correction trial. On the other hand, the correction trial after a lawsuit against a trial decision has been lodged is advantageous for a patentee in that correction can be made on the basis of determination by the collegial body of invalidation trials on whether a patent is valid and correctable. Therefore, to maintain this advantage, procedures for disclosing a determination by the collegial body of invalidation trials (advance notice of a trial decision) are established during the invalidation trial at a point in time when the trial decision is ready to be concluded, thereby providing an opportunity for making a correction in response thereto. According to this revision, when a final court decision on a patent right infringement lawsuit has become final and binding, and subsequently a trial decision on invalidation of a patent becomes final and binding, a party directly involved in a lawsuit is not allowed to allege in a request for retrial based on the court decision that the relevant trial decision on invalidation has become final and binding. Under the current system of the Patent Act, if, after a court decision on a patent right infringement lawsuit or compensation demanding a lawsuit becomes final and binding, a patent invalidation trial or a correction trial is concluded and becomes final and binding, and the content thereof is different from that on which the court decision on the patent right infringement lawsuit, etc., is based, there is a possibility that the final and binding court decision may be rescinded by a retrial by reference to the fact that “an administrative disposition which formed the basis of the court decision has been modified by a subsequent administrative disposition” (Article No. 338(1)(viii) of the Code of Civil Procedure). However, parties involved in a patent right infringement lawsuit are given an opportunity to conduct thorough discussion with allegations and defense about the validity of a patent and the scope thereof in the lawsuit on the basis of Article 104-3 of the Patent Act. Nevertheless, occurrence of the above-described situation leads only to repetition of disputes, and has been alleged to pose a problem in terms of dispute-solving functions such as a patent right infringement lawsuit and also in terms of stable corporate management. In other countries, including the U.K. and others a request for retrial has not been approved, since no retrial provision exists from the beginning; further, the People’s Republic of China, the Netherlands and others have set a provision to the effect that the retroactive effect is restricted when a trial decision on invalidation becomes final and binding. Further, in the U.S.A., where patent cancellation becomes final and binding by reexamination after a court decision favorable to a patentee becomes final and binding in a patent right infringement lawsuit, “the antiretroactivity doctrine,” which is a rule based on a decision by the Supreme Court of the United States, will apply, and the court decision favorable to a patentee is not to be revoked in the patent right infringement lawsuit which has become final and binding. This revision provides that a person who was a party involved in a patent right infringement lawsuit, etc., is not allowed to allege in a retrial, after a court decision on the patent right infringement lawsuit, etc. becomes final and binding, that a trial decision, etc., to the effect that a patent be invalidated, has become final and binding, thereby restricting the retrial. Further, where a trial decision on invalidation of registration of an extension of a term of a patent right becomes final and binding, a retrial will be restricted as in the case where a trial decision on invalidation becomes final and binding. Further, to make the restriction on retrial into a practically operable system, it is necessary that the conclusion of provisional disposition orders and that of provisional seizure orders, which are incidental to an infringement lawsuit, will not be revoked. Thus, even in a lawsuit for compensation for damages and a lawsuit for return of excessive profit with respect to creditors (patentees) of the provisional disposition orders and the provisional seizure orders, a person who was a party involved in a patent right infringement lawsuit, etc., is not allowed to allege that a trial decision to the effect that a patent be invalidated has become final and binding. This revision relates to allegation of a request for retrial that has been filed after the enforcement date and applies to a case that has been examined for validity and scope of patent on the basis of Article 104-3 of the Patent Act in a patent right infringement lawsuit. Furthermore, similar provisions are provided in the Utility Model Act and the Design Act. In the Trademark Act, retrial is restricted when a trial decision on invalidation and a cancellation decision become final and binding (Article 30 of the Utility Model Act, Article 41 of the Design Act and Article 13-2(5), Article 38-2, Article 39, Article 68-3 of the Trademark Act). 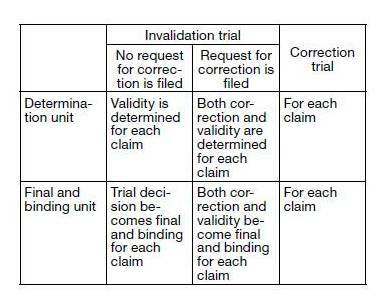 A request for invalidation trial and that for correction trial can be filed for individual claims, and in many cases, a request covering plural claims in one request for trial is included. However, no written provision on whether a trial decision on a trial becomes final and binding for each trial case or for each claim is provided. Thus, there has been a demand for clarifying the scope of a trial decision that becomes final and binding. 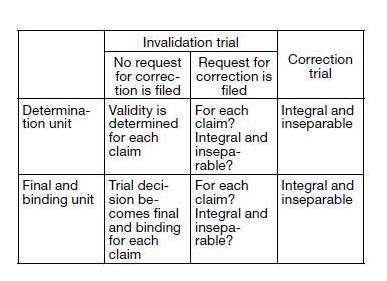 The table below shows the handling of the scope of a trial decision that becomes final and binding under the current system. A right holder is allowed to file a request for correction, in particular, in an invalidation trial. However, on the basis of a judicial precedent from the High Court of Japan to the effect that whether correction can be made in the above case should be determined individually for each claim (refer to the law report on civil affairs issued on July 10, 2008 by the Supreme Court, vol. 62, no. 7, p. 1905), this revision clarifies that a request for correction in a patent invalidation trial and a request for correction trial can be filed for each claim. Further, the provision of the Patent Act applies mutatis mutandis to the Utility Model Act. In the Trademark Act, it has been clarified that a decision on opposition to registration and a trial decision on an invalidation trial become final and binding for each designated commercial product and each designated service (Article 41, Article 47(2) of the Utility Model Law as well as Article 43-14, Article 55-3, Article 60-2, Article 63(2) of the Trademark Act). This revision will apply to trials demanded after the enforcement date. This revision will abolish the effect on third parties, among effects of trial decisions on a patent invalidation trial and others. The above Article stipulates that, when a final and binding trial decision in a patent invalidation trial or an invalidation trial of the registration of patent-term extension has been made, no one may file a request for a trial on the basis of the same facts and evidence (prohibition of double jeopardy). However, a possibility cannot be denied that even a request for a trial on the basis of the same facts and evidence may result in a different conclusion, depending on whether the allegation and presentation of evidence are made appropriately when a different person files a request for a trial. Therefore, it is not reasonable that the effect of a trial decision is extended to a third party who is given no opportunity to make any allegations in the above trial. In other words, it has been pointed out that it would be unreasonable to place restrictions on third parties not involved in a trial with regard to the right to contest the validity of the patent in the trial based on the same facts and evidence only on the grounds that a trial decision to the effect that a patent is valid has already become final and binding, or it would be unreasonable to place restrictions with regard to the right to contest whether the trial decision is right or wrong. Regarding systems in other countries, the Republic of Korea and the People’s Republic of China have a system similar to that of Japan in which a final and binding trial decision on an invalidation trial has an effect on third parties, while no other major countries have a system that covers the effect on third parties. As a result of the foregoing, among effects of trial decisions on a patent invalidation trial and others, the effect on third parties is to be abolished. Further, similar provisions will be provided in the Utility Model Act, the Design Act and the Trademark Act (Article 41 of the Utility Model Act, Article 52 of the Design Act, and Article 56(1) of the Trademark Act). To provide more effective remedies with regard to expiration of a time limit of the procedural period, the Patent Act was revised so as to be consistent with the Patent Act Treaty. An application made in a foreign language by filing of an application in English in Japan is approved. In this case, it is required to submit a translation thereof within one year and two months from the filing date (if the patent application is filed with claim of priority, the translation is to be submitted within one year and two months from the earliest claimed priority date). language, a translation into Japanese must be submitted within two years and six months from the priority date (when a national document for entering in Japan is submitted during a period shorter than two months prior to the date of expiry of the period, the translation must be submitted within two months from the date of submission of the national document). Then, under the current system, no remedies are provided for the case where the translation is submitted after the expiration of a time limit for submitting the translation. However, according to this revision, when a “legitimate reason” is found with regard to the expiration of a time limit of the period, remedial procedures allow the translation to be submitted within one year after the period has elapsed and within two months after the reason no longer exists. Further, similar remedies are additionally provided with regard to submission of a translation based on a PCT utility model application in a foreign language (Article 48-4 of the Utility Model Act). 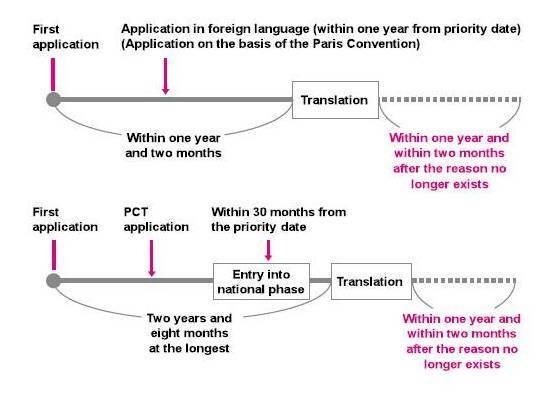 Here, it should be kept in mind that the above-described remedies are fundamental remedies for the expiration of a time limit of submitting the translation and not those for the expiration of a time limit of a priority period or expiration of a time limit of entry into the national phase of a PCT application. Entry into the national phase of a PCT application should still be carried out within 30 months from the priority date, with no remedies being available for exceeding the prescribed time limit. Further, similar remedial procedures will be provided in the Utility Model Act and the Design Act. In addition, when a request for the registration of renewal is filed after the expiration of a time limit in the Trademark Act, the request is allowed to be filed in accordance with similar remedial procedures (Article 33-2 of the Utility Model Act, Article 44-2 of the Design Act and Article 21, and Article 65-3 of the Trademark Act). An explanation will be made briefly for representative items. 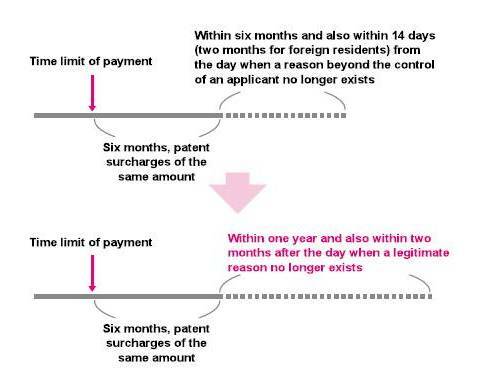 With consideration given to characteristics of both routes and backgrounds of introduction to the system in which invalidation of a patent is also determined by a court, the validity of a patent is still to be determined through two routes in the same manner as that conducted at the current time. Under the current system of the Patent Act, the same person is allowed repeatedly to file a request for an invalidation trial for the same patent. However, there is an opinion that a patent endlessly exposed to the risk of invalidation may impair dispute-settling functions of an invalidation trial. Further discussion is to be made about how to handle this issue of invalidation trials. Where a request for infringement injunction is filed in an infringement lawsuit, exercise of a right to require an injunction is approved in a uniform manner if acts of infringement of rights are found. There is an opinion that since an alleged infringer is heavily affected if obliged to stop business activities, the right to require an injunction should be restricted depending on the aim and aspect of execution of a right, as well as the business structure of an entity having the right. With consideration given to actual conditions of the execution of a right as well as discussions conducted in other countries, further discussions on how to handle the right to require an injunction are desirable in Japan.